Cinema on the High Street in Bromley. It was previously under the Empire brand photo, but in August 2016 it came under the ownership of Cineworld. 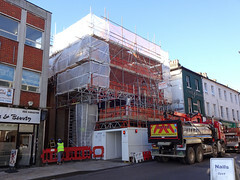 It later closed for a lengthy refurbishment (see photo on this page for progress as of October 2018) and is due to reopen in 2019 as part of Cineworld's Picturehouse sub-brand. Last edited 2018-10-31 12:18:54 (version 6; diff). List all versions. Page last edited 2018-10-31 12:18:54 (version 6).